USPA NEWS - Sands Resorts Macao has launched an Online Micro-Movie featuring International Businessman, Sportsman and The Venetian Macao Brand Ambassador David Beckham, along with several Chinese Celebrities, who take him on a Quest to find the Perfect Portuguese Egg Tart in Macao. Released on July 19, the Micro-Movie is a Light-Hearted Take showcasing The Venetian Macao, The Parisian Macao and Macao as Destinations renowned for Macao's Legendary Egg Tarts and a Must-Do on every Visitor's Agenda when they visit. 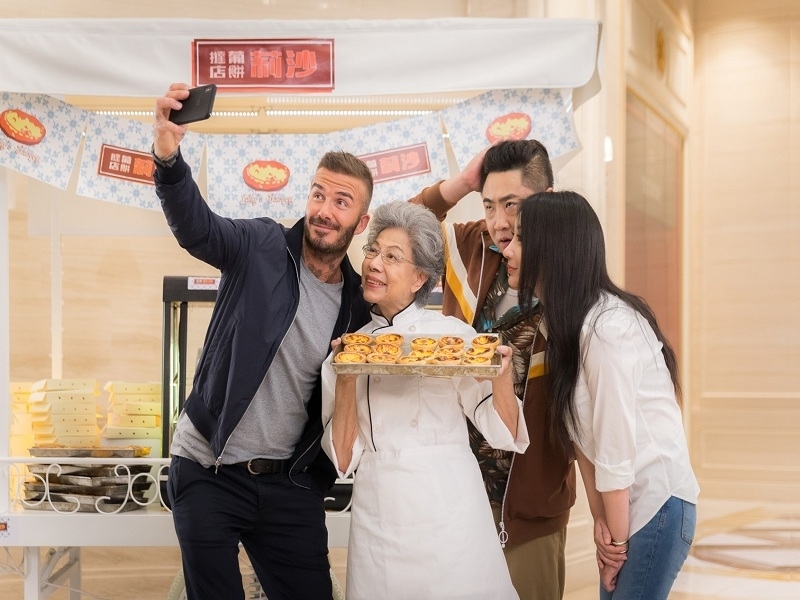 Sands Resorts Macao has launched an Online Micro-Movie featuring International Businessman, Sportsman and The Venetian Macao Brand Ambassador David Beckham, along with several Chinese Celebrities, who take him on a Quest to find the Perfect Portuguese Egg Tart in Macao. Released on July 19, the Micro-Movie is a Light-Hearted Take showcasing The Venetian Macao, The Parisian Macao and Macao as Destinations renowned for Macao's Legendary Egg Tarts and a Must-Do on every Visitor's Agenda when they visit. Joining David Beckham are leading Chinese Celebrities and Actors Qiao Shan (Taxi Driver), Yang Di (Waiter), Liu Yan (Taxi Driver's Sister), Lam Suet (Chef), Cao Tu Jun (Restaurant Staff) and Helena Law Lan (Bakery Owner/Grandmother). The Micro-Movie shows David Beckham reminiscing about a Previous Visit to Macao when he encountered an Elderly Lady, Sally, famous for her Egg Tarts. Keen to revisit her Renowned Bakery, David escapes the waiting Paparazzi outside The Venetian Macao in a Taxi, only for the Driver to unwittingly take him to a Random Cha Chaan Teng, or Traditional Chinese Cafe in Old Macao. Inadvertently his Comments offend the Store Staff which sets off a Chase around the Laneways before they make their Escape. Once David Beckham remembers he has the Original Egg Tart Wrapper from his first Meeting, the Taxi Driver realises it was his own Grandmother's Shop and they are reunited. But the Grandmother explains she has a New Shop, Sally's Bakery, and takes David there, only for him to discover it is actually back at Sands Resorts Macao's The Parisian Hotel. The Micro-Movie was produced by Leading Award-Winning Production House Traktor and supported by Ng Fan, Chief Creative Officer, Saatchi and Saatchi Shanghai, and was shot on location throughout many of Macao's Distinctive Landmarks and Laneways.